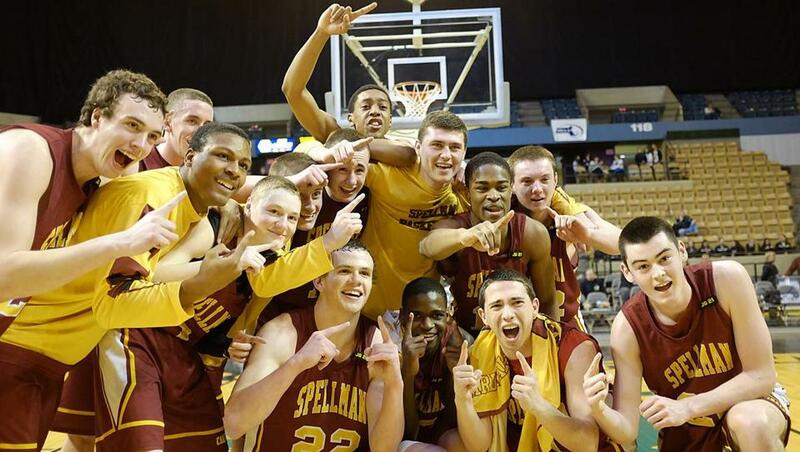 Cardinal Spellman players celebeated after claiming the Division 3 title. Mobley has already joined the 1,000-point club after scoring 23 points per game this season en route to his second straight Bay State League MVP award. Mobley shot 42 percent from 3-point land to lead the Tigers to the Division 1 South semifinals. Tthe Mass. Gatorade Player of the Year averaged 21.3 points, 6.5 rebounds and 5.9 assists during Central’s run to the Division 1 state final. Nelson, who finished with 1,512 career points,was named Merrimack Valley League co-MVP. The Hockomock League MVP broke the school record for career minutes played (2,032) while leading the Hornets (21-2) to the Division 1 South semifinals. DeAndrade scored 30 points in the season-ending loss to Catholic Memorial. The swingman averaged 18 points, 9 rebounds, and 4 assists per game to lead CM’s dynamic offense. Smith was named Catholic Conference co-MVP with teammate Aamahne Santos and led the Knights to the Division 1 South title and a 23-2 finish. The center averaged 16 points and 13 rebounds while leading the Patriots to the Division 2 state final. The Dual County League Co-MVP finished his career as the school’s all-time rebounding leader and third-best scorer. In his first year in the Cape Ann League, the forward earned All-Star honors after being named a Northeastern Conference All-Star a year ago. Bertrand averaged 27 points, 14 rebounds, and 4.8 assists,finishing with a double-double in all 24 games. The forward averaged 17.3 points, 12.1 rebounds, and 5.3 assists while leading the Anchormen to the Division 4 state championship. For his efforts, Bruce was named co-MVP of the Central Catholic League Small. Butka led the Raiders to a 19-0 start and an ultimate 23-2 campaign that ended in the South Division 1 title game. The two-time Patriot League champion averaged 18.7 points per game in the tournament this season. After being name a Tri-Valley All-Star in football, Byrnes capped his basketball career by earning Tri-Valley League MVP honors while leading the Clockers a 19-0 start before dropping their last two games. He finished with more than 900 career points. Giribaldi led the Warriors to a 19-5 finish while scoring 20.1 points per game and shooting 81 percent from the foul line. After being named Merrimack Valley Conference co-MVP, Giribaldi helped Andover reach the Division 1 North final for the first time since 2000. The power forward averaged 18.9 points and 10.4 rebounds while leading the Falcons to a 19-3 record and the Division 2 North final. Harris was named Northeastern Conference MVP for his efforts. The shooting guard averaged 16 points per game en route to earning Bay State Conference Herget Division MVP honors. James led the Raiders to a 16-6 record this season and finished with 750 career points. The point guard earned Greater Boston League MVP honors after averaging 19.3 points, 5 rebounds, and 4 assists this season. McLeod also hit 83 percent of his free throw attempts for the 16-6 Falcons. Murray, an athletic shooting guard, helped lead the Titans to the Division 2 state title by averaging 18.7 points, 5 rebounds, and 4 steals per game. He scored over 1,000 points in his career and earned Boston City League All-Star honors. The point guard averaged 14 points, 7.5 assists, and 4.2 rebounds while leading the Cardinals to the Division 3 state title. The two-time Catholic Central League Large MVP will play basketball at Stonehill College. The 5-8 point guard averaged 20 points and 6 assists en route to being named a NEPSAC Class B second-team member. He scored 1,126 career points and was named ISL MVP for his terrific final season. Swenson will play basketball at Connecticut College. After signing a national letter of intent to attend Purdue on a basketball scholarship, Taylor averaged 14.4 points, 10.8 rebounds and 3 blocks per game to lead the Beavers. This is the second All-Scholastic selection for the 6-10 center. The 6-2 shooting guard led Boston Trinity to the NEPSAC Class D championship and earned Class D Player of the Year and championship game MVP honors. Zouzoua was also the MBIL League MVP after Trinity claimed the MBIL title. One of the craftiest offensive-minded coaches in the state, Nault got his Raiders to the Division 1 state final after guiding them to a 22-6 season. In his eight years at the helm, the former Central Catholic player has a record of 179-27 and two state titles. Perry guided the Cardinals to the Division 3 state championship. Thirty-five years into his run heading the Spellman basketball program, Perry has 498 career wins and is now a two-time Globe Coach of the Year in both boys’ basketball and girls’ soccer. Coute guided the Cougars to the Division 4 South title for the second year in a row. Connolly went 20-0 this season against Division 4 teams before falling to St. Clement in the Division 4 state semifinals. Coute is 69-17 in his three seasons. McCarthy’s Titans went 24-2 en route to claiming the Division 2 state title. The Boston City League Coach of the Year has a 207-47 record over his 11-year career and has coached New Mission to three state championships over the last five seasons. Atlantic Coast — Dennis-Yarmouth: L.K. Metz, Spencer Tyler. Falmouth: Eric Demers, Ryan Johnson. Marshfield: Ryan Hatcher. Nauset: Razz Green. Plymouth North: Tommy Duddy, Angel Santiago. Plymouth South: Joey Good, Mike Mele, Ryan Morrissey. Sandwich: Joey Downes, Hank O’Brien, John Stanton. Bay State — Braintree: Keyshaad Dixon, Steve Leary. Brookline: Obi Obiora, Elijah Rogers. Milton: Anthony Smith. Natick: Alex Hilger. Needham: Ryan Charter, Mike Elcock. Newton North: Liam Bruno, Ezekial Fransisco, Tommy Mobley. Walpole: Scott Arsenault, Ryan Fogarty, Adam Quinlan. Wellesley: Aidan James. Weymouth: David Harrison, Ryan Jones. Big Three — Brockton: Jermal Murray. Durfee: Chris Farrington, Tyree Robinson, Nick Salmon. New Bedford: Ben Clark, Jaleal Massey. Boston City — Boston English: Stanley Davis, Shaun Miller. Brighton: Torrey Johnson, Jason Jones, Mark Mojica. Burke: Jesse Bland, Keshon Robinson, Jikhalil Smith. Charlestown: , Oliver Benner, Frederick Oliveira, Taris Wilson. CASH: Randy Butler, Kidante Roberts. Dorchester: Markus Neale, Khail Newson, Tavon Smallpiece. East Boston: Anthony Bruno, Joel Guevara, Dion Knight, Marcus Shaw. Fenway: Joseph Ceneito, Jonathan Davaeiga, Patrick Mansuy. Latin Academy: Chinedu Igbokwe, Rayshawn Miller, Devaughn Riley. Madison Park: Johnny Bowden, Donizete Fernandes, Terell Matthews. New Mission: Shaquan Murray, Frederick Rivers, Asante Sandiford. O’Bryant: Joseph Farrell, Benjamin Lawler, Ricardo Ortiz. Snowden: Javaughn Kittrell, Kareem Murrell, Derron Stone. South Boston: Solomon Abioye, Fred Smith. West Roxbury: Ruel Delarosa, Tysaul Horton, Raymond Tejeda. Cape & Islands — Cape Cod Academy: Johnny Hatem, Kyle Ryder. Cape Cod Tech: Jackson Calle. Nantucket: Will Ferreira, Riley Fusaro, Kyle-Andrew Irving. Pope John Paul II: Ben Gibson, Austin Houlihan, Diego Meritus. Sturgis East: Jake Tobey. Sturgis West: Mike Marsh. Cape Ann — Amesbury: Pat Halloran. Georgetown: Patrick Bjork, Matt Gott. Hamilton-Wenham: Jimmy Campbell, Henry Eager. Manchester Essex: Petey Morton. Masconomet: Jake Rudolph. Newburyport: Dillon Guthro. Rockport: Adam Balzerini. Saugus: Joe Bertrand. Catholic Central — Archbishop Williams: Sidney Limage. Arlington Catholic: Lou Doherty, Matt Wesoloski. Austin Prep: Rich Gilbride, Teddy Sackos. Bishop Fenwick: Matt Costello, Dom Luoni, Travis Maxner. Cardinal Spellman: Joe Crane, Rory Donovan, Austin Joseph, Ryan Roach. Cathedral: Donel Berryman. Cristo Rey: Chris Joyce. Lowell Catholic: Mustapha Koroma, Kyle Rafferty, Yi Shi, Connor Sullivan. Marian: Ayodeji Johnson. Matignon: Joe Feeney. Pope John: Nate Budwah, Tim Collins. St. Clement: Khaneil Bruce, Jack Hartnett, Eamonn Joyce, Emaru Pena, Brandon Williams. St. Joseph’s Prep: Randy Allen. St. Mary’s: Dennis Bailer, Curtis Lockett, Zach Louissaint, Anthony Silfa. Catholic Conference — BC High: Tom Glanaek, Phil Leotsakos, Jack Loughnane. Catholic Memorial: Gerard Adams, Kellan Grady, Aamahne Santos, Guilien Smith, Brandon Twitty. Malden Catholic: Michael Boyd, Karlens Joas, Joe O’Brien. St. John’s Prep: Max Burt, Max Butterbrodt, Kareem Davis, Ben Judson. Xaverian: Tim Riley. Commonwealth — Chelsea: Albert Alicia, Oscar Sabillion. Greater Lawrence: Alexis Estrella, Maikel Guerrero. Greater Lowell: Jayson Colon, Gbah Dulah, Angelo Pilato. Minuteman: Daryl Akins, Anthony Burns, Mike Weidiker. Mystic Valley: Jean Celstin, Matt O’Connor. North Shore: Yordany Sanchez, Trace Schaejee. Northeast: Nick Giangregorio, Ken Howse, Troy Tartarini. Shawsheen: Joe Mason. Whittier: Andre Hernedez, Mitch Rudis. Dual County — Acton-Boxborough: Alex Boyd, Nnamdi Udokwo. Bedford: Ben Johnson, Allister Williams. Boston Latin: Adam Mikula. Concord-Carlisle: Joe Crowley, Jon Dor, Jamir Henderson, Austin Hoey, Blaine Taylor. Lincoln-Sudbury: Sam Casey, Eric Mattia, James Mortimer. Newton South: Geoff Gray, Mark Karimy, Phil Levine-Caleb. Waltham: Christian LeJeune, Ryan Smith. Wayland: Andrew Carmichael, Robert Williams. Westford: Scotty Callahan, Dan Cornelius, Eric McCord. Weston: Brenton Ceasar-Allen, Jack Shay. Eastern Athletic — Bishop Feehan: Austin Burlone, Michael Nelson, Frank Oftring. Bishop Stang: Andrew Dessert, Ross Ketschke. Martha’s Vineyard: Navardo Anderson, Kane Araujo, DeShawn James. Somerset Berkley: Vaughn Browner, Mike Mahoney. EIL — Bancroft: Emmanuel Bangandozou. Beaver Country Day: Keyshaun Jacobs, Jeff Spellman, Jacquil Taylor. Concord Academy: Malin Segal. Landmark: Nolan Wilson. Lexington Christian: Akwasi Appiah, Adrien Ibeh. Pingree: John Spears. Portsmouth Abbey: Shamus O’Connor. Greater Boston — Cambridge: Fredens Deneus, Jakigh Dottin, Isaiah McLeod, Diandre Shouder-Williams, Demitrius Woodson. Everett: Rodwell Blanc, Gary Clark, Lubern Figaro, Timmace McKinney. Malden: Anthony Gilardi, Bryan Mitchell-Rodrigues, Mark Rogers. Medford: Dean Campbell, Darnell Richardson. Somerville: Fru Che, Rayoni Matos. Hockomock — Attleboro: Tim Walsh. Canton: Matt Kelly. Foxborough: Cam Seeley. Franklin: Marcus Giese, Chris Rodgers. King Philip: Jim Layman. Mansfield: Michael Boen, Ryan Boulter, Rocky DeAndrade, Kyle Wisnieski. Oliver Ames: Ryan Carney. Sharon: James Fritzson, Brian Mukasa. Taunton: Gerald Cortijo, Shaquille Davis. ISL — Belmont Hill: Sultan Olusekun, Harry Roberson. Brooks: Lavar Harewood, Ikenna Ndugba. BB&N: Ben Crawford, Nick Tarantino. Governor’s Academy: Matt Peart. Lawrence Academy: Kyle Howes. Middlesex: Aaron Swenson. Milton Academy: Alec Brennan. Nobles: Robert Martin, Johnny McCarthy. Rivers: Carlin Haymon, Matt Prokop, Jermaine Samuels. Roxbury Latin: Patrick Benzan. St. Mark’s: Marcos Echevarria, Aaron McLean, Jordon Scurry. St. Paul’s: Ethan Schlager. St. Sebastian’s: Jordan Brydie. Thayer: Conor O’Brien. MBIL — Boston Trinity: Sam Brown, Avalon McLaren, Nisre Zouzoua. BU Academy: Nate Gruver. Brimmer & May: Jacob Quiles. Cambridge Weston: Nica Franklin, Evan Smith. Chapel Hill: Gordon Gao. Commonwealth: Phil Budding. Covenant Christian: Zach Enfield, Mardochee Faustin, Sam Rourke. Gann Academy: Harris Wallack, Zach Weiss. Learning Center: Iromilson Centeio. Newman Prep: Berry Wu. Waldorf: Rio Liu. Waring: Alex Mitchell, Charlie Mitchell. Mayflower — Avon: Sean Manning. Bishop Connolly: John Goncalo, Dylan Holland, Jack Santoro. Bristol Aggie: Dan Cominsky. Bristol-Plymouth: Matt Cassese, Jacob Gorman. Diman: Austin Crowninshield, Matt Feliz, Brynn Pasternak. Holbrook: Bobby Belezos. Norfolk Aggie: Evan Witherbee. Old Colony: Jacob Pringle. Sacred Heart: Sam Boyles. South Shore Voc-Tech: Joseph Draicchio, Korey Fitzgerald, Michael Reale. Southeastern: Jaylen Jones, Steven McCall, Gabriel Pereira. Upper Cape: Austin Smolinsky, Rally Wheaton. West Bridgewater: Justin Berglund, Connor Cullinane. Westport: Rich Hartnett, Tom Yeargin. Merrimack Valley — Andover: David Giribaldi, Connor Merinder, EJ Perry. Central Catholic: Nick Cambio, Aaron Hall, Tyler Nelson. Chelmsford: Mike Calicchio, Jack Campsmith. Dracut: Dan Zabbo. Lawrence: Kevin Fabian. Lowell: Sean Bryan. Methuen: Tim Burke. Tewksbury: Justin Derrah, Alex DiRocco. Middlesex — Arlington: Miles Robinson. Belmont: Matt Kerrins, Adam Kleckner. Burlington: Shane Farley, Christian Morneweck. Lexington: Hugh O’Neil. Melrose: Sherron Harris. Reading: Drew Belcher. Stoneham: Steve McGrath. Wakefield: Chris Calnan. Watertown: Cesar Fulcar. Wilmington: Connor Bennett. Winchester: Michael Grassey. Woburn: Jimmy McRae, Andrew Murphy. Northeastern — Beverly: John Berchcoff. Danvers: Devan Harris. Lynn Classical: Phil Rogers. Lynn English: Fred Hogan, Eric Rosario. Salem: Jamie Dominguez. Old Colony — Barnstable: Elijah Baptiste, Derek Estes, Izaiah Winston-Brook. Bridgewater-Raynham: Jamie Carey, Joe Freiday. Dartmouth: Cody Borges, Nick Simonetti. Patriot — Duxbury: Noah Schwanke. Hanover: Jack Buckley. Hingham: Joe Leahy, Tom Staley. North Quincy: Efthim Butka, Matt Gerakis, Anthony Green, Kyle Richardson, Solomon Umoren. Pembroke: Tim Curley. Quincy: JT Bain, Brendan Cunningham, James Lam, Drew Myers. Scituate: Ben McLarey, Noma Okundaye. Silver Lake: Tanner Bouchard, Pat Cotter, Josh O’Neill. Whitman-Hanson: Shane Devlin, Zach Downey, Brian Feeney. South Coast — Bourne: Jacob Ashworth. Case: Nick Kenyon, Felipe Pires. Dighton-Rehoboth: Keanu Baltazar, Ben Roache. Greater New Bedford: MaCabe Martins, Nick Portelance. Old Rochester: Jeremy Bare, Paul Graves. Wareham: Latroy Hairston, Mason Vasconsellos. South Shore — Abington: Alex Nagle. Carver: James Frazier. Cohasset: Henry Brown, John Buckley, Rocco Laugelle. East Bridgewater: Ryan Graham, Mike Kelly. Hull: Mike Warren. Mashpee: Kevin Frye. Monomoy: Evan Forgeron. Norwell: Stephen Kulka. Rockland: John Furr, Ian MacDona, Matt Nicholson. Tri-Valley — Ashland: Joe Byrnes. Dover-Sherborn: Andreas Kontopidis. Hopkinton: Christopher Moberg. Medfield: Drew Shea. Medway: Alex Nadtochij. Norton: James Loring.